Whenever I mention clicker training, the majority of people scoff, roll their eyes, and proceed to lecture me about how I am going to ruin my animals. There seem to be many misconceptions about the method, and people tend to approach it with a bad attitude. Before you say, "she's just some granola yahoo" and exit out of this, I just have to say one thing: Beezie Madden has used clicker training. Do you consider her to be a granola yahoo? I'd say not! Myth 1: Only Weekend Warriors who cry "horse abuse" at everything use clicker training. This is not the case at all! Judgement ISF, one of Beezie Madden's jumpers, used to have huge issues with jumping water. Beezie used clicker training/target training to help overcome his fear issues. The pair actually won the $1,000,000 CN International back in 2005, so I think it is safe to say that clicker training did not ruin Judgement. Myth 2: Clicker training will cause horses to become mouthy. This is the myth that really grinds my gears. Just like with anything, even something as small as feeding treats has to be properly trained. Aggressive behavior is a result of improper training, and you need to head back to the basics. That being said, when you first begin clicker training you may notice mugging behavior. This is simply because they have not been properly treat trained. While Jethro never had issues taking treats, Ypke was absolutely awful and I thought the clicker had ruined her. What I did to combat the issue was tie her to the hitching post, take a couple steps back, and wait. At first she tried to reach over and bite me, so I turned around and waited again. She soon lost interest and looked away. That moment was precisely when I gave her a click and a treat. By doing so, I reinforced that she doesn't get treats because she is being mouthy or because she wants a treat right then and there, she gets one when she is being respectful and I think she deserves one. After about a week's worth of short 15 minute sessions each day, the mouthy behavior disappeared. I don't even remember the last time that she has tried to bite me! Myth 3: Your horse will not behave unless you have the clicker 24/7. Wrong!! The whole goal of clicker training is to wean your horse off the clicker. For example, Ypke used to have a terrible habit of blowing past the bit and racing around at the trot as fast as she could go. I wanted a slower, almost Western pleasure jog. At first, I asked for a couple strides of the jog and gave a click and a treat. Gradually, I began expecting more and more steps of slow jog in between each click. 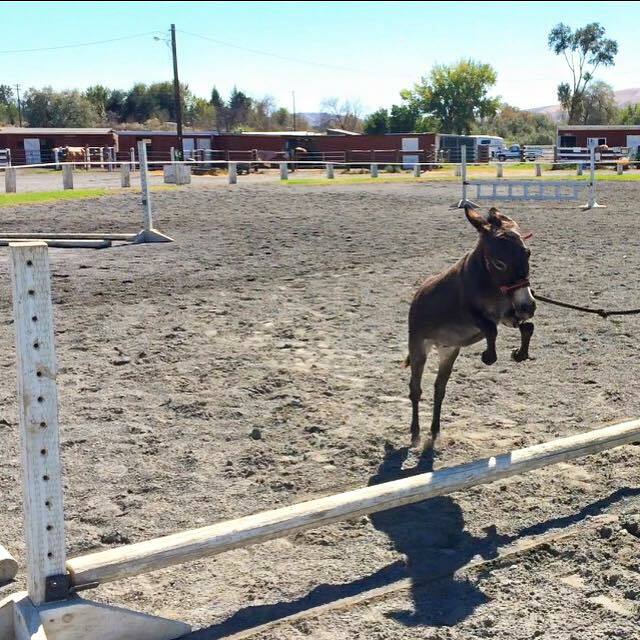 Now, I don't even need to use the clicker for her jog — she just does it no matter how many laps around the arena we do. Another benefit: their necks get super flexible. Myth 4: Clicker training is solely for tricks. As you probably figured out from the Beezie Madden paragraph, this is also simply not true. The clicker is just an interesting, concise way of telling your horse, "YES, that is what I want." That's it. Really. It is just a reinforcement tool. 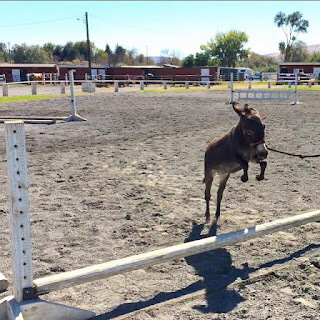 Whether you do eventing or barrel racing, you can integrate the clicker into your training program. 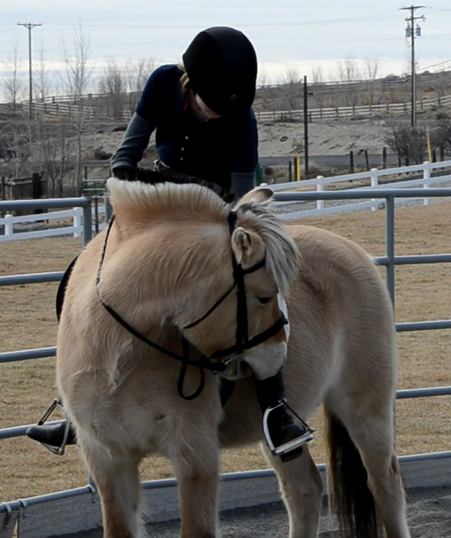 It doesn't matter if you do natural horsemanship or use traditional methods — the clicker is just a reinforcement tool. Jethro's latest work-in-progress trick: "Donkey Brain Teaser: can you put the hoop over the cone?" i will never get over how cute jethro is (even if he was naughty at the fair haha). i've never tried clicker training but have read enough success stories to believe it's a pretty legitimate approach. glad it's working for you! Thanks, I don't think I will either haha. Luckily he is already getting better! this is great. i had no idea that beezie clicker trained. It is actually surprising how many well known riders use the clicker as reinforcement. I read an article the other day about Steffen Peters using clicker training. That's so cool! I've never used clicker training but I can see how it can be a great tool. Maybe I should have used a clicker with Rico and his one tempis, they were so hard to put on him. I'll definitely keep it in mind for the baby horse. It really comes in handy whenever Ypke & Jethro aren't quite understanding what I mean when introducing something new. Wow, I had no idea that people thought clicker training was a bunch of granola yahoo! That makes me sad. I've never used it with my horses but I am a big fan of it in dogs. It's a GREAT tool to have in your box. Maybe it is just where I live, but I get scoffed at a lot for clicker training. It definitely works with a lot of animals and is useful to know! Exactly, it can never hurt to be aware of other training tactics! clicker training is the bee's knees and cat's pajamas!! i don't own a horse so i don't quite have the chance to do that but i have a cat who is highly food motivated and he's been trained to respond to necessary commands (like come and sit) to the novel like high five and nose kiss. there's also scientific studies (unfortunately i can't cite them.... but one of karen pryor's book has details) about how the "click" travels through the brain. great job and great post!!!! Interesting! I never really thought about cat training before, but that is a valid point. Just goes to show how versatile the method is. Well done & important info! Solo is not very food motivated, so the several really cool things I thought of to try & teach him back then with the clicker...let's just say they were met with a "meh, give me the treat, don't, I don't care..."
BUT the one huge thing it did work for was his phobia of longe whips due to past abuse. He understood the clicker concept very quickly, it just wasn't worth doing extra work for. But it did provide the perfect reassurance framework for him to go from rearing, shaking, running away at the sight of a long whip to finally accepting rubs with it.